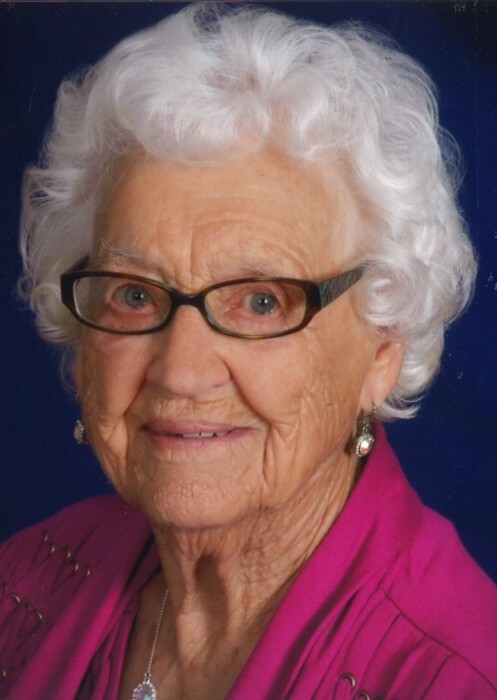 Evelyn Emma (Smith) Petersen, 96, of Baldwin, Iowa passed away peacefully in her sleep in the late afternoon of Friday, November 23, at the Wheatland Manor in Wheatland, Iowa. She was surrounded by family and loved ones. Evelyn was born on September 11, 1922 in Big Rock, Iowa to Harold and Edna (Siebel) Smith. Evelyn attended country school in Big Rock. On October 6, 1942, Evelyn married Elmer Petersen in Lost Nation. They lived outside of Lost Nation until 1966 when they moved to the Eden Valley/Baldwin area. They farmed together in Eden Valley until 2003. Elmer and Evelyn traveled all over Eastern Iowa to participate in dances on Saturday evenings. They cherished their dancing friendships. In addition to dancing, Evelyn enjoyed farming, quilting, and spending time with her family - especially her grandchildren and great-grandchildren. Those left to honor Evelyn’s memory include her children Gloria (John) Aplin of Denver, Colorado; Merle (Diane) Petersen, of Oxford Junction, Iowa; Bruce (Lori) Petersen; of Lost Nation, Iowa; Durene (David) Tabor of Monticello, Iowa; and April (Luke) Lubben of DeWitt, Iowa; 22 grandchildren, 28 great-grandchildren, and sister-in-law, Carol Smith. She is preceded in death by her husband, Elmer; her parents; brother, Harold Smith; sister, Margie Rife; and sister; Jeanette Von Essen. Memorials may be directed to Camp Courageous and Bethlehem Lutheran Church. Her funeral service will be held on Wednesday, November 28, 2018 at 10:00 a.m. at Bethlehem Lutheran Church in Lost Nation where there will be a visitation one hour prior to the service. A visitation will be held on Tuesday, November 27, 2018 at Bethlehem Lutheran Church in Lost Nation from 3:00-7:00 -p.m. Burial will be held at Smithtown Cemetery. Lahey & Dawson Funeral Service of Lost Nation is caring for Evelyn at this time.